Combine the cornmeal, flour, and baking powder. Beat egg whites until light and fluffy. Beat together the apple juice, milk, and oil; gently fold in egg whites. Stir in dry ingredients. 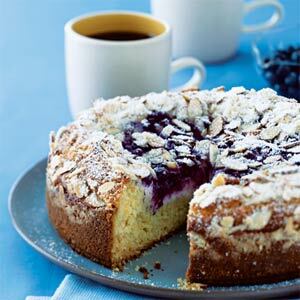 Pour batter into an oiled cake pan, sprinkle with the blueberries. Bake at 425 degrees F. for 30-35 minutes or until golden.